Format: Kindle, ebook 449 pgs. There are a number of hidden factors that tend to go against the project from the start. 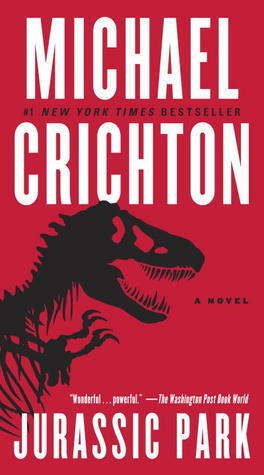 Lewis Dodgson, a geneticist in competition with Hammond’s findings, plans a way to steal the dinosaur genes: “…he was the head of product development at Biosyn, which supposedly consisted of ‘reverse engineering’: taking a competitor’s product, tearing it apart, learning how it worked and then making your own version.” (72) Taking on Dennis Nedry, the project supervisor of InGen, as an inside man, the embryos that Dodgson demands are in reach. This alone sets off a number of problems, as Ian Malcolm’s (the mathematician) proposed Chaos Theory predicts. The Chaos Theory, also known as the Butterfly Effect, is a dynamic principle that basically states that anything (non-linear) can be influenced by any amount of variables that in effect render any long-term outcomes or predictions impossible. Natural systems are the best example of this phenomenon, meaning Jurassic Park is no exception and that it’s vulnerability to fail (especially with what the park contains) can and will be catastrophic. Another factor involved with the mysterious Jurassic Park is a question of how the Compy’s (small chicken sized dinosaurs) are getting to the Costa Rican mainland and attacking people. Hammond is suspiciously trying to cover himself and the park by saying that it is impossible form the small dinos to have come from Jurassic Park because of it’s intense security; he then proceeds to try to manipulate the park’s systems to prove so. Hammond and his geneticist Dr. Wu, has explained that even if (and that’s a strong hypothetical “if”, according to them) an animal were to escape, it wouldn’t last more than 24 hours out in the wild because they were genetically altered to exclude the lysine amino, which is essential to life and they could only receive through supplements on the island. Another precaution they claimed to have taken is by making sure the animals couldn’t reproduce. They make sure that they only grow female animals, and they irradiate them for further prevention. Or did they? With the stubborn Hammond in control of this operation Jurassic Park, how far will the chaos theory travel? I loved Jurassic Park from beginning to the end. The research, statistics, science, math and just overall knowledge contained in this book, albeit a fictional journey, had be pinned to the book with enthusiasm and wonderment. This fantasy action adventure fueled by the chaos theory and people wanting to play God, is a mastermind in it’s ability to trust it’s curious readers with how to interpret the message of Jurassic Park; that life, full of consequences and hope, is unpredictable. Although a lot is going on throughout the book, the plot’s tempo is being driven by a simple boat. That is to say, it’s a race against time to get into communication with a boat that is unknowingly carrying Compy’s from Isla Nublar toward the Costa Rican mainland, no doubt the reason for the recent lizard attacks there. To me this is a great way to keep the book organized and on point. As Jurassic Park deviates from tourist attraction to potential disaster, readers are left to wonder how much damage could be done and if there is any way to eradicate the problems created from this chaos. I loved the movie as a little girl, but this book is on another level. If helped, this Jurassic Park should definitely be read before seeing the theatrical picture, because it conveys so much more with the imagination than any screen possibly could. I give this book a firm five stars, and am pumped to start on the next book of the series.